Version 4.0 includes built-in FTP ("SmartUpload"), personal and family notes, and ability of hiding specific individuals. 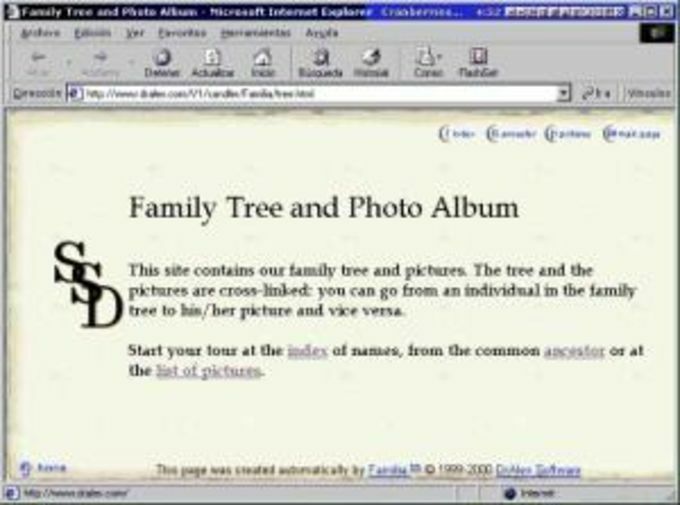 FamiliaBuilder allows you to put your family tree and photo album on the Web. It can read genealogical data from GEDCOM files. It lets you create a photo album, add picture descriptions, and link pictures with individuals. Each individual in a group picture can be identified, thanks to the rectangle-tool functionality within the program. After you have entered all your data, FamiliaBuilder generates an elegant-looking, fully cross-linked Web site, with a customizable first page, index of names, family trees, personal pages, pictures, picture lists and thumbnail galeries. What do you think about FamiliaBuilder? Do you recommend it? Why?